Nesting in the foothills of the Nilgiris, Bandipur National Park is one of the most famous national parks in South India and a premier wildlife destination. Spread over an area of 874 sq. km, this national park in the Mysore district in Karnataka was originally the private hunting ground of the Maharaja of Mysore. 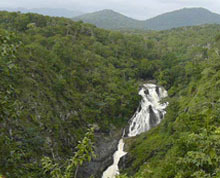 The Moyer River forms a natural boundary between the Bandipur National Park and the Mudumalain Wildlife Sanctuary in Tamil Nadu. Bandipur National Park came under the auspices of Project Tiger in 1973. An integral part of the Nilgiri Biosphere Reserve, Bandipur National Park holds a large and varied flora and fauna populations. Its flora includes deciduous, evergreen and scrubland vegetation. Within the confines of the park are found tiger, elephant, chital (spotted dear) leopard, sloth bear, gaur (Indian Bison), dhole ( Asiatic wild dog), striped hyena, spotted deer, sambar, mongoose, barking deer, slender loris, langur and mouse deer. Reptiles found in the Bandipur National Park include Indian python, flying lizard, cobra, common rat snake, common krait, viper and flying snake. 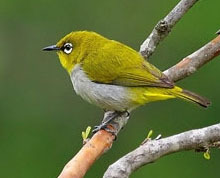 The park boasts one of the largest concentrations and varieties of avian life with about 230 species of birds. Prominent among them are egret, peafowl, stork, warbler, wood pecker, heron, drongo, sanpiper, kite eagle and lapwing. Accommodation of various types is available at Bandipur National Park catering to the needs of wildlife and nature lovers coming to explore this famous wildernesses area. The place abounds with luxury resorts, forest guest houses, budget hotels and rest houses that make your staying here absolutely entertaining. Bush Betta Wildlife Adventure Resort, Tusker Trails, Forest Dept Cottages and Hotel Mayura Prakruti are some of the accommodation options during your visit to Bandipur National Park. It would be a step in the right direction if you make your bookings in advance to ensure a good accommodation that would let you enjoy your amazing trip to Bandipur National Park. By Air: The nearest international airport to Bandipur National Park is Bangalore which is 220 km away from the park. All international and domestic airlines operate flights from Bangalore to all major cities of India and vice versa. By Rail: The nearest railhead for Bandipur National Park is the Mysore railway station. You can take Shatabdi Express that connects Mysore with Chennai. A good many train services operate between Bangalore and Mysore. Mysore is well connected by road with Howrah, Mumbai, New Delhi, Hubli, Miraj, Tirupati, Thanjavur and Tiruchirapalli. 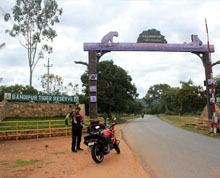 By Road: Bandipur National Park is well connected by road to different parts of India. Major cities and places near the park connected with it by road are Mysore ( 80km), Bangalore (220km), Coimbatore in Tamil Nadi (168 km), Ooty (Ootacamund) (79 Km) and Mudumalai Wildlife Sanctuary (19 km). Forest Department Safaris take place between 6.00 a.m. and 9.00 a.m. and again between 4.00 p.m. and 6.00 p.m.
19 km from Bandipur National Park, Mudumalai Wildlife Sanctuary in Tamil Nadu is another important wildlife destination. 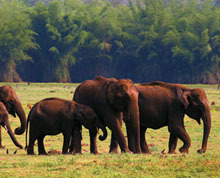 It is a right place to spot elephant, chowsingha, gaur, mouse deer and sloth bear. The picturesque mist clad hills of Gopalaswamy, 20 km from Bandipur National Park, is home to a beautiful temple dedicated to Venugopalaswamy (Lord Krishna) dating back to the Hoysala period. 80 km from Bandipur National Park is located the historical city of Mysore which boasts a stunning diversity of architecture, several museums, art galleries and places of interest including the famed Mysore Palace. Not to be missed is the Dussehra festival which attracts thousands of visitors. The renowned hill station of Udhagamandalam, or Ooty as it is popularly called, is located at an elevation of 2,240 metres above the sea level. The picturesque landscape, gushing waterfalls, parks, gardens, lakes- all these go along way in making Ooty a wonderful place to visit. It is rightly called queen of hills. Located in the state of Tamil Nadu, Ooty is 79 km from Bandipur National Park.